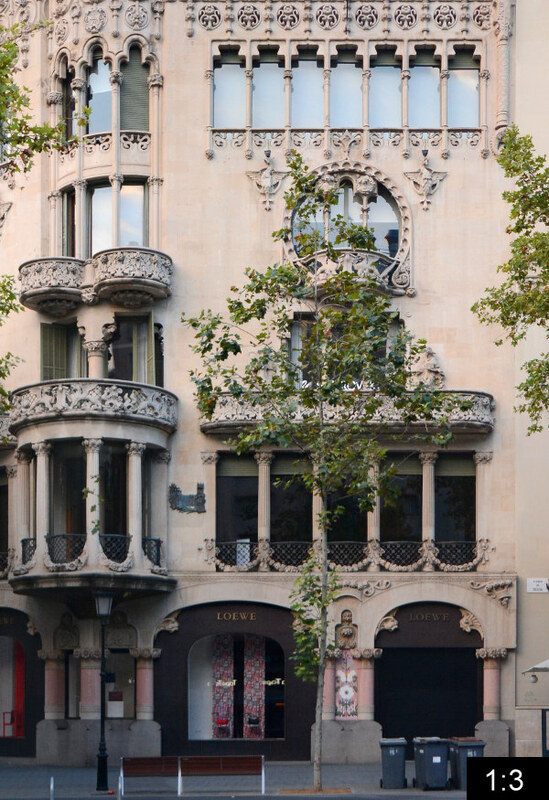 The most prominent and elegant shopping street in Barcelona has to be the Passeig de Gràcia, which connects the Placa de Catalunya in the south with the city quarter Gràcia in the north and runs through the Eixample. The Eixample is a planned 19th century extension of the old overcrowded Barcelona. Hence a lot of representative buildings were errected at the time along its main streets. A special mention is owed to this street block, which entered architecture history as the so called Mansana de la Discordia. This refers to the “apple of discord” of Goddess Eris from the greek mythology. The word mansana means apple and block at the same time and therefore transfers the mythologic meaning onto the street block. Why? 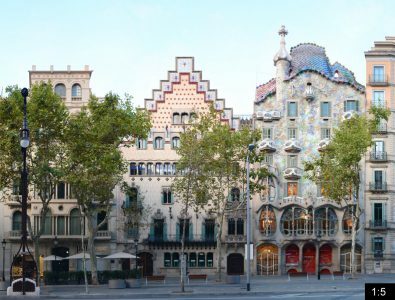 Around 1900 a number of the most prominent modernisme architects (catalan version of Art Nouveau) created buildings in their very own style right next to each other – within this one street block – creating a built competition of modernisme. At the left edge we see the Casa Lleó-Morera by Lluís Domènech i Montaner (1902-1906, Prize of the city of Barcelona 1906), next to it the Casa Mulleras by Enric Sagnier and two more to the right the Casa Amatller (1890-1900) by Josep Puig i Cadafalch, built for the chocolate dynasty of Amatller. 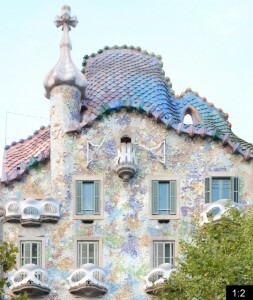 The most popular and most unique however is the Casa Batlló (1904-1906), redesigned by Antoni Gaudí for the industrialist Josep Batlló i Casanovas. 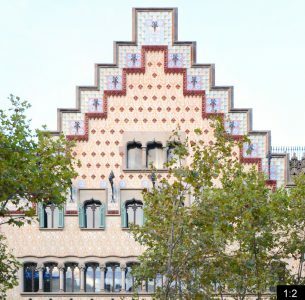 The facade resembles the legend of catalunyas patron Sant Jordi, the roof resembling a dragon’s back, the tower a lance. 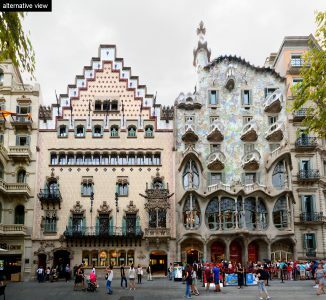 For its unusual window and balcony design, resembling bones and skulls, the people call it the Casa dels Ossos (bone house). 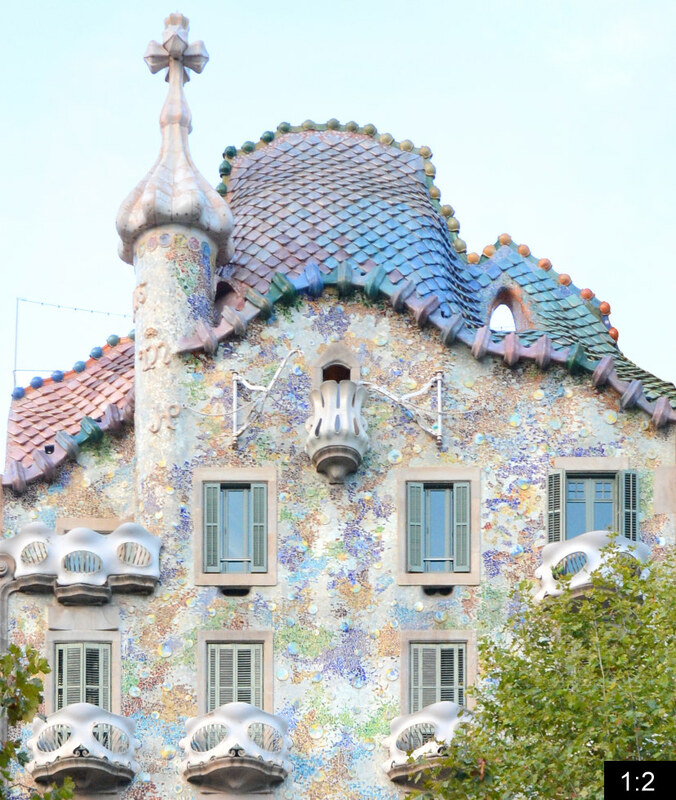 The Casa Batlló is a prominent tourist attraction and can be visited like other Antoni Gaudí works. 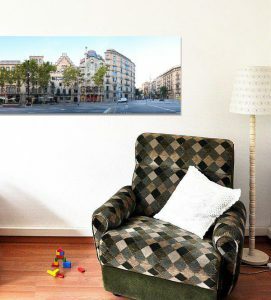 Another mention is owed to the bench/lantern combination by Pere Falqués i Urpí which can be found along the Passeig de Gràcia and one of which is visible in the panorama above. 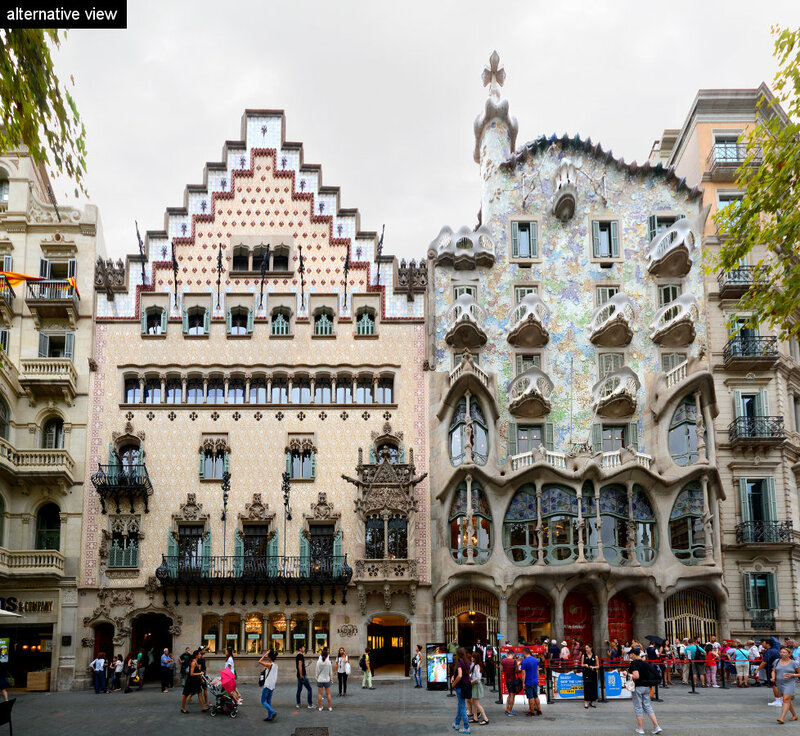 This streetline panorama view of the Passeig de Gràcia in Barcelona was presented in week 24 of our 101 weeks 101 cities of europe project, together with more streetline previews of Barcelona.